My so-called CIVILIAN LIFE: buy Wongstar stickers! help fix my knee! Tomorrow I'm going back to Dr. Shiple's office at the Center for Sports Medicine for my first ultrasound-guided PRP injection. PRP stands for "platelet rich plasma" and he will basically take some of my blood, centrifuge it, then inject all the happy little platelets (which have magical healing properties) back into my knee. It's a pretty awesome new procedure that will help my ligament get put back together again, unlike Humpty Dumpty. It actually sorta kinda sounds like blood doping but I am making sure it gets cleared through WTC and USAT so I'm not busted for cheating. 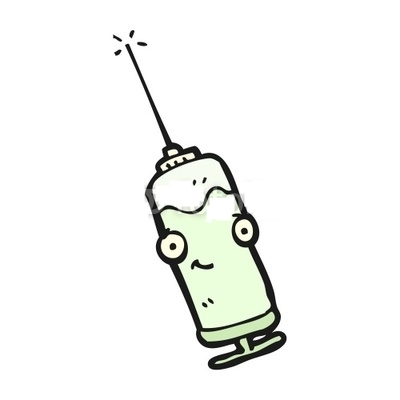 But that's how effective it is! Olympic athletes need to get a "therapeutic use exemption" thingy if they are getting these magical shots. Here is an article that was just published last week in the NY Daily News about it: "Runners can turn to Platelet Rich Plasma injections for hamstring issues, but cost is a deterrent." Sigh. So what to do? I've been meaning to manufacture some cool Wongstar stickers to help promote myself as a superstar and perhaps sell them for a good cause. There are lots of good causes out there to fund raise for; I always wanted to help out some of those international prosthetics & orthotics organizations... Well, over the past 4 years, I've learned that the best way to help them out was not to send money, but to donate my own personal time and skills. Many patients in the Philippines, Thailand, and El Salvador all got some good Wongstar karma and smiles. And now I'm a patient too...does that make me a good cause? SO. 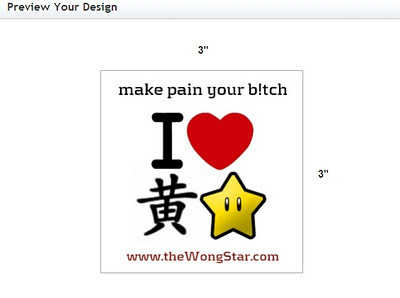 For a mere $10, you will not only get TWO of the super awesome 2011 LIMITED EDITION Wongstar fan club stickers shown above (3 x 3 inches)...you will actually get to help my knee heal faster so I can get back to the business of being a triathlon superstar! I will even throw in a personally autographed Haamonii postcard (while supplies last of course). $10 includes shipping. International fans may need to throw in an extra $1. I am hoping to have 100 fans take me up on this deal so that I'll have enough money for the cost of the injection after the printing expenses. Stickers won't come in for another 2 weeks, in the meantime I will go ahead and setup a P.O. box (so stalkers can't find me) and configure the Paypal account. 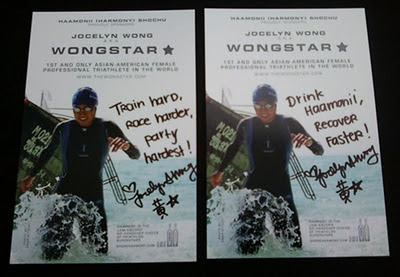 Or you can write a check if you are like Momma Wongstar. :) I am also happy to take bank transfers! Who wants to buy a sticker?? ?